7.5″ X 5″ academic year planner. 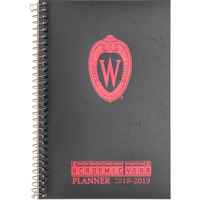 July thru August weekly format planner has a red cover featuring a silver Wisconsin shield W.
7.5″ X 5″ academic year planner. July thru August weekly format planner has a black cover featuring a red Wisconsin shield W.